This question often gets raised by people delving into the world of the Ryukyus and even by linguists in the field itself. Go on Wikipedia and you might learn that there are some six Ryukyuan languages recognized by UNESCO; visit another article and you might discover that there could be up to ten distinct languages. So why then is there such a big discrepancy, and what might be the actual figure? The answer is a little more complex than one might think. As some may know, the boundaries between what are considered "languages" and what are considered "dialects" are often confounded. Generally, most people would assert that languages are mutually unintelligible whereas dialects are intelligible to each other. Unfortunately, while this sounds nice on paper, more often than not, the distinction is simply a matter of politics. Realistically, some languages might be intelligible between themselves, while some dialects can be entirely unintelligible. This is especially aggravated by a linguistic phenomenon called "dialect continuum". The idea stipulates that within a dialect continuum, two neighbouring dialects will be quite similar and therefore intelligible. But the further away you go from one point, the more the difference is marked and the less intelligible two dialects from different points of the continuum become. As mentioned, the recognition of what constitutes a language often boils down to a matter of politics. Since the Ryukyu Islands do not constitute an independent state, this recognition falls on the shoulders of the Japanese government and academic world. Up until very recently, all of the Ryukyuan variants were simply considered dialects of the Japanese language, and heavy efforts were made by the Okinawan government itself to faze out these non-standard varieties. By this principle, none of the Ryukyuan varieties are considered languages by the government, even to this day. Nevertheless, this now seems to be reversing as a result of works by linguists and through international recognition. Visit Wikipedia and out of twenty languages, only the Japanese article considers Okinawan to be a dialect. UNESCO itself has even gone to publish that it recognizes six Ryukyuan languages. So while many Japanese, even within the Ryukyu Islands, still refer to the traditional tongues as dialects, there appears to be a strong cultural shift moving towards recognizing them as languages and as important pillars of the local culture. 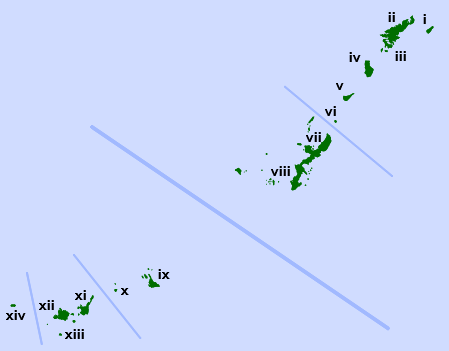 It is generally agreed upon that the Ryukyuan languages can be divided into two main linguistic branches, corresponding to the largest gap between the islands. The Northern Ryukyuan branch (1) encompasses everything from Amami to Okinawa, while the Southern Ryukyuan branch (2) comprises the islands going from Miyako all the way to Yonaguni. However, Yonaguni (e), which is spoken on the southwestern-most island of the Ryukyus, is sometimes considered a third branch of its own. Within the southern group, the distinction between the main linguistic groupings is clear enough that their status as languages encompassing a number of related dialects is rarely questioned; though there are ambiguous variants that fall somewhat in between such as Tarama-Minna. However, this is not the case for the northern branch, where the distinction between the Amami and Okinawan variants is more difficult to establish due to a dialect continuum phenomenon. While the northernmost variants such as Kikai are unintelligible to the southernmost Okinawan dialects, the distinction between Northern Okinawan and Yoron, for example, is far less marked. As a result, given that the divisions are fuzzier in the North and clearer in the South, it would be possible to say that, conservatively, there are four mutually unintelligible languages: Northern Ryukyuan, Miyako, Yaeyama and Yonaguni. However, the current trend seems to be moving towards recognizing a higher number of regional languages, for both cultural and linguistic purposes. 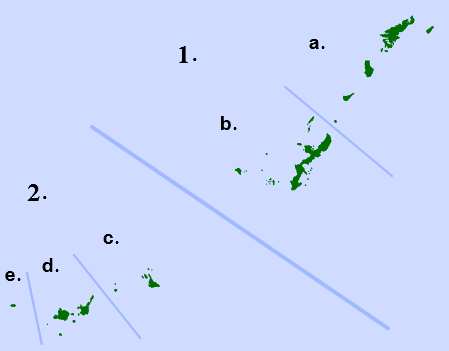 These further divisions often correspond to some of the next major islands, such as Okinoerabu and Yoron, or to north-south oppositions, as seen in Okinawa. Of course, this still remains a generalized outline, and the tongues of some of Okinawa's smaller islands could very well be distinct enough to merit their own class, while some of those presented here may not be. The Ryukyu Islands give way to two undoubtably distinct branches within which we could conservatively recognize four mutually unintelligible languages: Northern Ryukyuan, Miyako, Yaeyama and Yonaguni. This conservative approach is, however, generally ignored and Northern Ryukyuan is often split into two groups: Amami and Okinawan. UNESCO and Wikipedia further recognize two Okinawan languages, for a total of six Ryukyuan languages: Kunigami (Northern Okinawan) and Central Okinawan. Even then, a further linguistic and geographical analysis reveals some fairly important key areas whose variants could also potentially be considered languages of their own right, encompassing a number of local dialects. Some examples include Okinoerabu, Yoron and Tarama-Minna, among others. Altogether, it would be possible to consider upwards of ten to fourteen Ryukyuan languages, and the Ethnologue currently recognizes a total of eleven different Ryukyuan languages. For the sake of preservation and to eliminate cultural stigma, it may well be worth recognizing a greater number of languages as opposed to a smaller number. Just for the record, Ethnologue lists 11 Ryukyuan languages divided into 2 branches. It is interesting that it recognises that Yonaguni is a seperate languages but also Miyako and Yaeyama in the same status as a language under the Sakishima Branch. The Amami-Okinawan branch includes 8 languages. The 4 Amami languages agree with your list, whereas the Okinawan languages include Kunigami as a separate language and merge the two Okinawans as one. For the 3 Sakishima languages it mentions Tarama-Minna as a dialect of Miyako and Ishigaki and Hateruma as dialects of Yaeyama but doesn't mention Iriomote. Yonaguni doesn't mention any dialects. I briefly mentioned the Ethnologue in the conclusion (though admittedly not in detail). The goal wasn't so much to provide an exact number or the exact divisions, but rather to provide an explanation of the various discrepancies between sources: some say 4-5, some say 6, others say up to 13 or so. Which one is right depends on how conservative or liberal you want to get. For the purpose of JLect's dictionary, I simply mark as much detail as I can get, all the way down to the city or village if possible. This way, I can make note of how "today" is chuu [t͡ɕuː] in Shuri-Naha, but kuu [kɯː] in Itoman. kiwisushi The 4 Amami languages agree with your list, whereas the Okinawan languages include Kunigami as a separate language and merge the two Okinawans as one. Just to clarify, what I call "Northern Okinawan" and "Southern Okinawan", the Ethnologue calls them "Kunigami" and "Central Okinawan". I'll never know why it adopted this terminology, but "Kunigami " refers to Okinawa Island's most northern district (even though the Ethnologue admits "Kunigami" is spoken through the centre and the north of Okinawa Island).